My peers and I were looking for answers long before we had any idea at all about the questions we would really be asking as parents. I read a whole bunch of books but didn’t get a whole lot of anything from a single tome. Instead, I grabbed desperately at whatever selective pieces that happened to fit me and my offspring at the time. I think it was the same for my friends. Some of what everyone said made sense, just not all of it. I found some comfort in the conflicted offerings from Get Out of My Life but First Could You Drive Me and Cheryl to the Mall. At the time, I don’t know that I fully understood why author Anthony Wolf couldn’t give me the hard-and-fast answers for which I was searching. Even then, though, I think I got that his hands-in-the-air attitude might not be far from where we’d all end up eventually. Trash barrel day at Wolf’s house was Wednesday. It’s the same for us, but unlike the happy ending at Wolf’s home, I still can’t get Michael to acknowledge the barrels’ curbside presence and miraculously return them to their garage home without prompting. Ever. On the other hand, in Michael’s expanded world, he seems to be catching on to some of the logic behind the pick-up-after-yourself mantra that I’ve espoused since the day he was born. chain didn’t prevent Michael from sharing with me what a slob he thought the guy was. I’m not talking about spilled beers and cigarette butts. That’s more reminiscent of my day than his. Rather, at the top of the list of unacceptable offenses was that the guitarist in the session had replaced his strings and left the littered remnants scattered about the studio. Considering how many times my vacuum cleaner has been felled by an errant guitar string or two, I could have easily noted the hypocrisy of Michael’s complaint. Instead, I listened, agreed and we talked about some respect-for-everyone studio strategies that might work into the future. Michael doesn’t put the barrels away and he collects water glasses in his bedroom like they’re souvenirs. 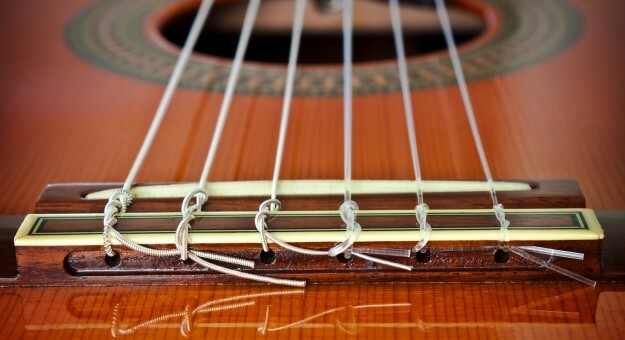 I did note, however that Michael changed guitar strings recently. And the leftovers were neatly tied together and tossed in the trash. Alex wasn’t a napper. Although she slept through the night early-on, she was up most all of the day. So, to get the occasional daylight break from my very active infant, I needed to be creative. After much new-parent experimentation, I discovered that the most effective trick in my toolbox of sleep techniques was placing Alex in her swing and playing a selection from Phantom of the Opera. If you’re familiar with the musical, there is a beautiful love song that closes the first act. Alex would eventually learn All I Ask of You on piano as a gift to me. Offering protection and the soothing of wide-eyed fears, the piece makes for a beautifully resonate lullaby. All I Ask of You, however, wasn’t the tune to which my daughter settled to sleep. Instead, the one surefire song that sent my baby to slumber was the powerful and loud instrumentation of the overture. To the music of a bellowing organ, a bass-heavy assortment of orchestra brass and woodwinds, a flourishing accompaniment of strings and a powerful selection of percussion that included a loudly vibrating timpani, Alex would nod off. A fit to her personality in many ways, but also perhaps a supporting argument for the unwitting influence of invitro activity. Convinced that having babies might put a damper on my frequent theatre treks to New York (big understatement), I had to see Phantom before delivery. Paying a premium for the seats (Alex’s dad still doesn’t know just how much I shelled out for those tickets) and flying to New York when perhaps I shouldn’t have (apparently airlines discourage women from flying too close to their due dates), I made the trip, saw the play, was captivated by the music. And apparently so was my unborn child. Phantom wasn’t the only musical backdrop to her young life, however. I love music. I’ve shared that love and the full assortment of my musical library and tastes with my children. Soon, they began to return the favor. First it was the music of their laughter, belly giggles that bubbled from deep in their tiny bodies and spilled over in sparkles from their eyes. Then there were the school-learned ditties they performed in public and private recitals, over and over -and over. Still later, it was the litany of their conversation, a multitude of newly-found syllables and sentences. But finally, it was their own selection of radio stations and CDs that wrested away my full control of the musical sounds emanating from the stereo and the car radio. Being older, Alex held sway with her idolizing younger brother for a bit. Then, he fell under the more musically diverse influences of his older cousin Jonathon. A war ensued. And I was left to straddle a demilitarized zone between a battle-of-the-bands conflict as the clash of their tastes played out from side-by-side bedrooms. Their versions of what constituted “good” music were vastly different from one another, and neither of them had a problem with upping the amperage in an effort to drown out the musical competition next door. Michael emerged the victor. In part, because he is the truer musician, but also in a nod to the diversity of his tastes. The performers who flavor his musical palate are too numerous to list: Thelonious Monk, Stevie Wonder, Victor Wooten, Dave Matthews, Radiohead, The Beatles, The Red Hot Chili Peppers. The list is varied, wide and willingly and continually expanding. Not only does he fill up and often control the IPod dock; he replicates the music of his favorite artists and creates much of his own. He plays -just about everything. And brings in his friends to jam with him. Our house has an open floor plan. There isn’t a room from which you can escape the sound of the music. But then, I don’t really try. With the exception of his occasional drum solos, I embrace the tunes, dance and sing (poorly) along. Because, the thing is, it’s really good music. I’ll admit I miss the melody of giggling babies, questioning toddlers, curious little kids. I miss my son’s voice in meandering conversation. I miss the connection, the words, the interaction. But for now, I’ll have to accept their alternative. Because even in the dearth of conversation, I still hear traces of who my son is in his music. If I listen closely enough, I hear Michael -in his music. I’m probably too old to go to rock concerts. Not just to share the experience with my kid. He’d prefer I didn’t. And it isn’t to name myself at an in-vogue event. They are; I’m not. I actually go for the music. A gazillion years ago, some long-ago forebears of ours came out of their caves and started making noise. Most of them likely uttering guttural, pretty unpleasant sounds. Grunting –probably the root vocabulary of teenage boys. But then there were the others. Emerging from those very same caves, sometime after the last hunting party had gone off for the day, they made their own sounds. I imagine upon their less-stressed entrance to the day, their attitude wasn’t so much ready-for-the kill, as ready-for-breakfast. And the tenor of their voices, less get-going and more get-down. Against the grain of their tribesmen, against even the instinct of their survival, they heard –and listened to- the beat of a different drum. I live with one of those. Even on the worst of days, he still emerges from his own cave –with music. In his heart, in his hand, by way of an instrument, and in his hum. And as much as he hates the possibility, he gets that from me. Music is passion and even if I can never be its direct participant, I can connect to the notion of doing something you love –merely for the sake of doing it. So I go to rock concerts. And often find myself too close to stoned and sweaty 20-somethings, singing along to lyrics I probably shouldn’t know. And I watch the guys on stage and live vicariously. The best of them are still shouting and strumming about the inequities of life. The youngest rail against the closest of their authority figures –parents, teachers. But those with a bit more depth take on other enemies of the day –big business, big government –the “man.” They’re burning with their own passion, but also trying to light a fire under those oft-apathetic kids in their audience banging their heads to the beat. Rockers try to send a message. With their music. A long time ago, another generation did this with gusto. They built a genre around a war and made a difference. It would be nice if Michael and his ilk could do the same. It’s not that they lack talent or intelligence or even passion. What seems still missing among he and his bandmates are those other necessary components that enable one to reach a goal: a lot of work, sacrifice, follow-through. His dream is like a distant island. He’s more than willing to put his feet in the water, swim a few strokes in its general direction even. But a stray piece of driftwood, a rough sea, and he’s fully sent adrift. What he really needs is a good solid boat. Problem is, building one takes a whole lot of effort. Forethought, exertion, follow-through. Maybe even a bit of tutelage under a good boat builder. I go to rock concerts and hear the music. I get lost in the lyrics and sucked into the dreams. Because I still believe that dreams can come true. Not just for the guys on the stage fulfilling their own. But also in their dream of reaching the masses, getting a message through, making a difference. One of Michael’s favorite bands is pretty intent on not just playing the music. The lead singer has the audacity to believe that he and his music can make the world a little better. But he’s not a kid anymore. Michael needs to do more than put his feet in the water if he expects to make it to that island. He needs to build a boat.